Hymnodia: Kenneth & Olumide Top Outstanding Performances in Stanza 10 Show, Abigael Goes On Probation For The First Time. As efforts by the nine hymntestants on the Hymnodia reality TV show to clinch the grand prize continue, Kenneth Ekhuemelo, the bassofundo leapt over all the hymntestants with the top performance at with the top performance of the Stanza 10 performance show. Olumide Dada, the baritone, however, continued his consistent streak for the 6th consecutive week of being among the Top 2 performers. In the last stanza, these Hymntestants thrilled the audience with hymns created out of popular choruses with codified stanzas. After their great performances, it was a daunting task for the judges to separate the performances by the seven surviving hymntestants but it had to happen. While Kenneth and Olumide were adjudged the outstanding hymntestants after the close contest on the theme “Chorus to Hymns”, Abigael Nnadi slipped from the top slot from the preceding show to enter the probation list for the first time on the show tagged the art of worship. Three others join her on probation and a place in the wilderness for the stanza. They are Uduakobong Akpan, Mobolanle Oladimeji and Jemine Edukugho. Prior to the stanza performances proper, the Hymnodia anchor had announced the hymnviction (elimination) of two hymntestants based on the public votes on stanza 9 performances. The eliminated hymntestants were Blessing Agu (0002) and Juliet Nwabia (0005). 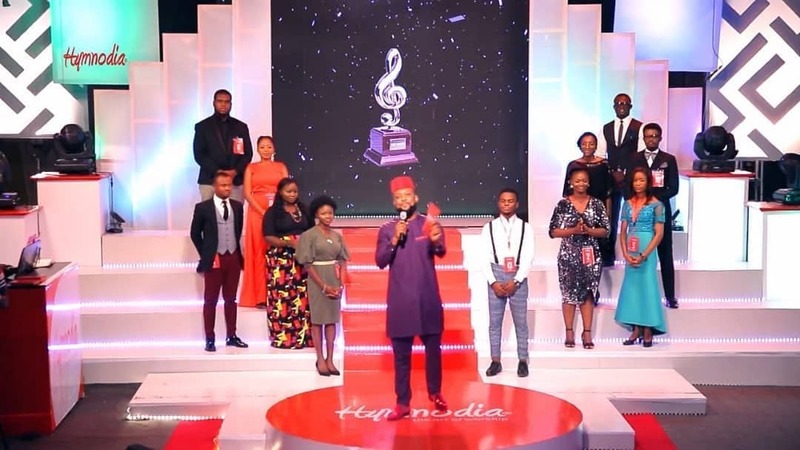 Elimination from Hymnodia is by public votes after judges have put them on probation and the process is audited by the reputable firm of Gbenga Badejo& Co.
Hymnodia commenced airing on February 3, 2019, as a one-hour programme on Lagos Television (Channel 256 on DSTV, Channel 90 on GOtv and Channel 113 on Startimes) with a magazine show on same channels on Thursday evening. It is also streamed live online via the LTV App available on the app store and on the dedicated YouTube channel, Hymnodiahq. The show can also be viewed on eight additional stations around the country. These include GITV, Kaduna; Anambra Broadcasting Service, Onitsha; Ondo State Radio/TV, Akure; ITV, Abuja and Cross River TV, Calabar. Others are Akwa Ibom Broadcasting Corporation (AKBC); Kwara TV, Ilorin and Plateau Radio TV, Jos. All the stations show Hymnodia on the same days (Sunday and Thursday) but at different times. KufreEkanem, Managing Director of Philosoville Limited, initiator of Hymnodia said “the entire Hymnodia team is fulfilled by how positively the Hymnodia idea has been accepted by the viewing public in just its first season. As we move towards the grand finale, the essence is to provide a rousing finale to ensure that the hymn culture gets a boost from the concert of hymns”.